The RetroSound® Hermosa retains the original look of your Corvette while offering the most modern electronic features available. The Hermosa has built-in Bluetooth® wireless connectivity, so you can safely make hands-free telephone calls through your audio system. You can also stream music via Bluetooth®from any smart phone: any application on your phone -- including Pandora®, iHeart Radio® and SiriusXM®satellite radio -- can be streamed wirelessly through your system. The Hermosa features an AM/FM tuner. A rear-mounted USB port allows you to play MP3/WMA music files through your system using up to a 32GB flash drive -- enough space for as many as 7000 songs. Two rear-mounted auxiliary inputs for portable devices such as iPod®/iPhone® or portable satellite radio are also included. Dual color (white or green) illumination lets you customize the Hermosa to your vehicle's interior. A built-in 25 watts x 4 channel RMS amplifier provides plenty of power to your speakers, and dual RCA pre-outs let you add external amplifiers. 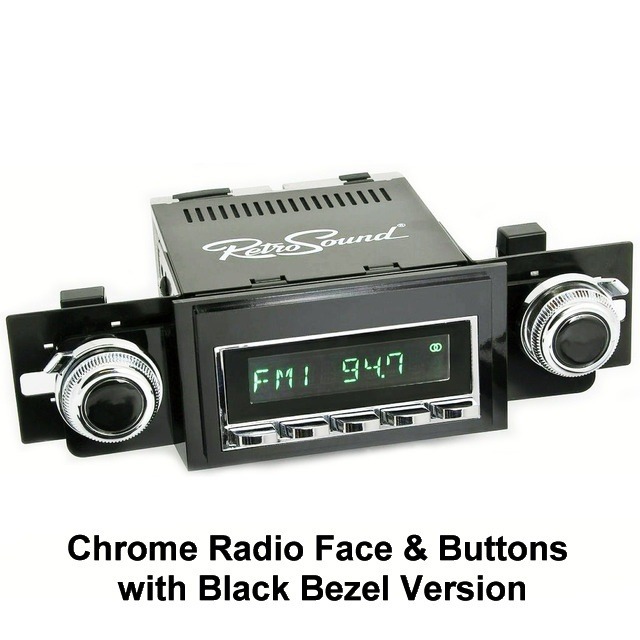 Our RetroSound kits are preconfigured with the bezel and knobs that most closely reflect the radios original to the Corvette.